What if there was a gadget that unified the computer freak with the nature lover? 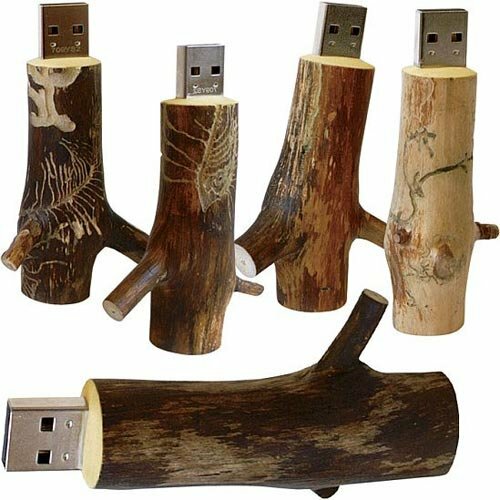 Look no further as twig flash drives turn your machine into a tree hugger. Whether you perceive them as trees or twigs depends on your perspective of course. Standing up they look like tree trunks and when planted into your USB pot it seems as if your computer is eager to branch out. Whatever their position, they appear sawed off (no, not with a chainsaw flash drive) but actually they’re hand-carved from real, collected wood. Each single one, so no twig flash drive looks the same and may actually represent a different type of tree. The original artist responsible for barking up the right stick is Karin van Lieshout from OOOMS. Bearing up to 16GB of fruit, tree trunk flash drives can live as a firm root for your system. So much so that even the Q-branch of MI6 hands these out to their 00-agents. However, that might be just a secretly hushed rumor. So even if you’re not an ecology minded tech geek, tree flash drives can certainly grow on you. And in case you use a certain brand of laptop, make sure it doesn’t fall far from them. hello there im interested in the Branching out flash drive but i would like to know if you make them in 16 gb capacity and how must will it be, do you ship to Guatemala. I don’t produce or ship these flash drives. You are taken to the actual distributor once you click on the link, in this case Dynamism. You have to contact them with your questions. I’m not sure if they can do 16GB but I’m pretty sure they can ship to Guatemala. In their FAQ it says “For an accurate quotation, simply begin the checkout process and the shipping charge will appear on screen as soon as you select your region.” So just go ahead and do that. If it’s too expensive you can easily cancel the process. Alternatively you may be able to find these tree flash drives on ebay. In that case they should be showing at the bottom of this page. .-= Wardrobes For Sale´s last blog post ..White Wardrobes for Sale =-. Those sure are green (well brown) I love the natural designs but what if you leaf them on the floor – they might get tossed in the fireplace. .-= Earth Friendly Goodies´s last blog post ..My iPhone Just Got Greener – the Kindle for iPhone App =-. If that happened you would treat yourself to a very intriguing color display by the fire. Oh my goodness, that looks awful! I think the USBs are really interesting on their own but seeing them ‘growing’ out of the computers like that is just too weird, even for me. But then I don’t like to see things growing where they shouldn’t be. I’m strange like that. Seeing a twig growing out of someone’s computer would give me the urge to yank it out. why not see it more positively like nature and technology working together in harmony? So no yanking please. Hahaha! Where do you get these ideas! They should do USB sticks with the heads of American presidents or world leaders. I keep pointing out that these designs are not my ideas. I’m glad you enjoyed the post though. p.s. : I’m afraid that if they did world leaders the USB drives would suffer heavy abuse. This is so cute..I like the one who looks like a wood. Who would know that it is a flash drive until they will see that you used it. Perfect for an art and for the agent.